As I have previously hinted, (or in fact stated) I spent this past weekend at the Tewkesbury Medieval Festival. This is the largest Free Medieval festival in europe apparently and it certainly is massive. It involves a reenactment of the Battle of Tewkesbury from the War of the Roses and a very large medieval (and medieval-ish) market and lots of entertainment! Mythago are invited every year to dance there as part of the official entertainment. We generally do one official stand where we tell a story and one or two other stands with one off dances. It is generally an awesome weekend, a large proportion of the side comes along to it and we camp in a large sort of huddle and make it into a very sociable event! 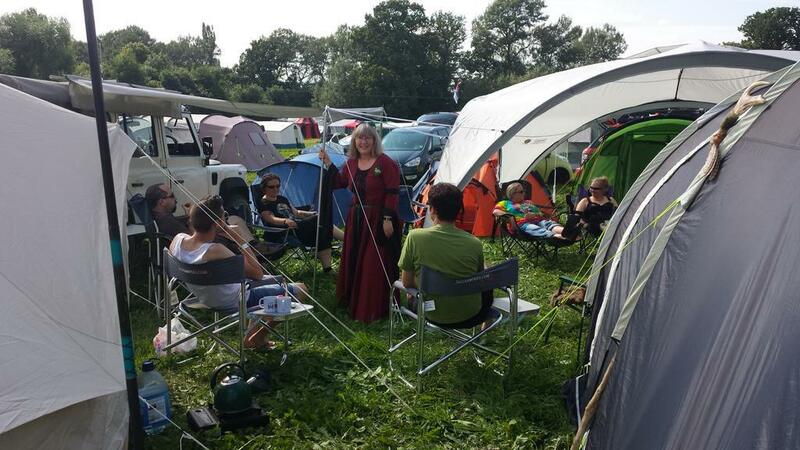 Look here we are camping…I am there in the background and one of our number is even in medieval dress! This happens a lot at this festival…there are more medieval clothes than any other! That was a little bit of a shock to the system I can tell you, I thought I was drinking enough and I wasn’t aware of feeling too bad…until I was! We are not the only crazy people out and about in weather inappropriate kit either, there are a lot of people dressed as knights…in the full kit with wool and padded under garments and basically big tin cans over the top! There was a lot of it about…they reenacted the battle both days, it was very impressive! The second was, again, the story of the Kings Men. We decided that a large percentage of the audience would be different so it was ok to do that same story, and they definitely seemed appreciative! Next Stop Blaming the Diabetics! Heat stroke is scary stuff. I’m so glad to hear you recovered so quickly. During my week at the Biggest Loser Resort I allowed myself to get dehydrated during one of the hikes and it gave me flu-like symptoms for 24 hours. It’s amazing how quickly heat stroke or dehydration can sneak up on you – where you go from feeling fine to feeling like death in what seems like an instant. It is terrifying isn’t it! I was literally putting my kit on for the last dance stand when I started shaking and shivering and my hands went blue despite the rest if me being hot! I was quite surprised to wake up feeling fine on Sunday!! Thank goodness you knew better to stop and just lay down rather than try to dance some more! I thought I was going to until my friend asked me if I was ok…and I just said no and started crying because my skin hurt! I was really strange I didn’t know until that point that I wasn’t well! Yep! That’s the scary part, how sudden the onset is. I’m so glad you caught it in time before things got more serious. Me too! It is very scary! I had a horrible feeling at one point that I wouldn’t be ok to dance on the sunday either…but thankfully I was ok! It was quite scary! I still haven’t managed to see the battle reenactment (saturday I was feeling ropy and sunday it clashed with our dance set), but it sounds impressive from the noises coming from the battle field!